But for many adult babies, a crib is something they dream about but don’t always have a chance to experience. And so I can’t help thinking how important it would be to ensure that a crib helps a little guy feel safe and babyish. Bed time becomes an extra special experience for a little guy. The loving care that a daddy shows as he puts him in a thick night diaper, the sound of the snaps being done up along the legs and inside of his sleeper, the smell of baby lotions and powders, will already have your little guy relaxed and in a gentle space for bed. 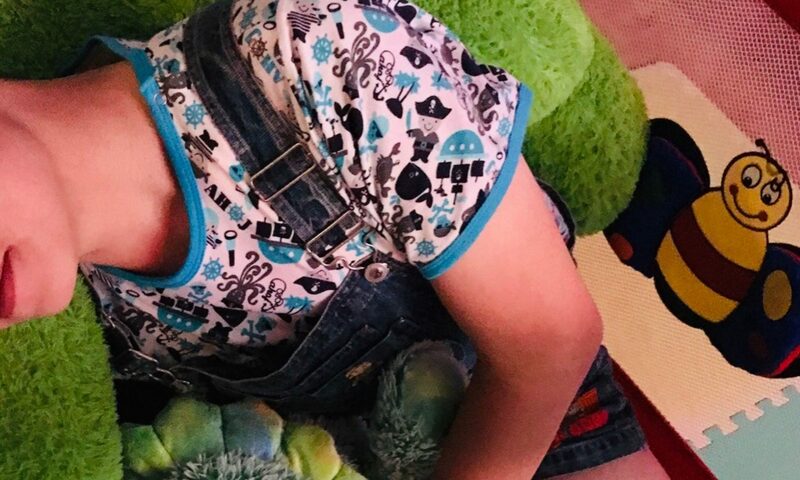 Snuggling your little guy as you read him a story, or the special bond that you feel as you give him a bottle before bed are ways to show your thanks for the gift he’s given you of tenderness and a willingness to be cared for completely. A crib then becomes an extension of the trusting space between a daddy and ‘son’. I like to think of the relationship between a daddy and adult baby as one that starts with small gestures, that creates a zone of trust and care, and that can grow over time. What might start in a diaper change, an evening cuddling and watching movies, can enlarge so that over time your little guy will feel that a great part of his life is encompassed in the safety and guidance of daddy’s care. Even when he’s at work or school, a diaper discretely protecting him from accidents, he’ll feel that he’s accepted for the little guy he is inside. And being put to bed in his crib is an important way to deepen the sense of safety and the acceptance of his true age. 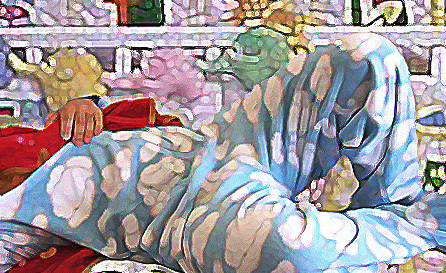 A crib provides a nest of safety and a way to send a little boy into dreams in which the thick diaper between his legs and the rustle of the crib sheets remind him, even in his dreams, that he’s daddy’s baby boy. There will be as many preferences for cribs as there are dads and ‘sons’ I think. Some will prefer natural woods, others particular colors. 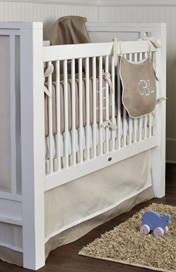 I’m personally a fan of a white crib with rounded bars, for example. – A little guy won’t just be SLEEPING in a crib. There will also be quiet time, naps, or those moments before he falls asleep when he’s in a nice relaxed but playful mood. A crib should have visual, auditory and tactile stimulation – a mobile overhead, toys attached to the sides of the crib, and stuffed animals inside. – Pattern and color are important. Depending on who you’re caring for, that might mean bright rocket ship prints, Sesame Street blankets, or soft pastels in baby blue or yellows. – A little guy should feel no anxiety or concern about using his diapers while in the crib. It’s critical to have a plastic sheet lining the mattress. If it’s crinkly sounding, that’s even better – the sound and feeling will reassure him that even if the thick night diapers leak, there’s no real harm. He should learn to be entirely comfortable using his diapers. This is one of the first steps in returning to the natural state of night wetting. – Texture is also important. Soft blankys, plushys and other gentle materials signal safety, comfort, love and babyish feelings. – The railings of the crib should be sufficiently high and durable so that he feels safe and secure. The sound of the crib bars being raised at night gives, I think, an incredible feeling of reassurance and safety. – A dad should almost always use a baby monitor. A video or audio monitor is like a line of security between a dad and adult baby. Your little guy will know that daddy is watching out for him and will be there if he’s needed – a bad dream, a late night diaper change, or a blanket that needs to be pulled up to the little guy’s chin. In fact, tucking in a boy at night is perhaps the perfect way to end any day. As he lies in his crib, gently stroke his back or hair, give his thick diapered bum a reassuring pat, make sure that he has his pacifier (clipped to his sleeper or onesie) and then carefully raise the bars of his crib. Make sure that his mobile is on so that the gentle motions, colors and sounds make him sleepy and relaxed. Keep a night light on as well, especially useful for a middle of the night diaper check (and change if needed, just try not to wake the little tyke! ), and for keeping scary monsters at bay. As you quietly leave the room, you’ll look back and see your baby boy all safe and snug in his crib and feel assured that he’ll have a cuddly, safe sleep and perhaps even dream of his daddy. Nice and i love it. I will sleep in this crib. well this lil guy would give anything to sleep in a crib! even reading your description of it here stirs an ache inside, a longing for the safety and absolute babyishness of a crib. the sounds of a mobile above and the assurance that the crib stays warm and dry and cozy whether or not the baby is wet or dry. for me it would be an absolute fast track to regress back to total babyhood. Thanks for doing such a good job writing this Daddy. When I read “He should learn to be entirely comfortable using his diapers. This is one of the first steps in returning to the natural state of night wetting.” I felt so high knowing you encourage us little guys to wet in our sleep. Also, can you give me more info and perhaps a photo of the crib featured in this article? It looks like something I’d like to buy. Very nice article. The pictures above look like they are an actual baby crib. Am I correct? As for sources of high quality custom builders the options are very limited it seems. There is one guy you may want to check out I found him on Rupadded, username is foxcub and it seems that he takes commissions. Oh I love sleeping in a crib, it is so comforting. I am building my new crib at the moment. But if I lived in the states I would just have it made by Thrashbear. His work looks unbelievably good. And I can’t believe how little he charges for the quality of the work. No association, just in awe of this guy’s stuff. I WANT ONE I WANT ONE I WANT ONE I WANT ONE PLEASE PLEASE PLEASE PLEASE PLLLEEEEAAASE? WITH SUGAR AND CHERRIES ON TOP??!! I’ve always wanted one. I would have a mobil of stars and moons and the crib would be painted all white! I would sleep in it every night looking up at the mobil waiting to drift off to sleep paci in mouth and a bottle of water by my side. oh how I wish I could have one! I want a crib for myself if I should ever find a big of my own, however, I am still in an adult body so do they make these things big enough to house a proper mattress? Yes vendors do make cribs that are the proper mattress size. My crib is a double mattress, and T- Bear could have made mine with a twin but I opted for the bigger size so it was more like a playpen size too if need be. I thought it would be too confining for me in a twin and I would get “klobberphobic” 🙁 Another friend has a twin from another vendor that made it for them. They love their twin. neat.. yea I have a crib, just no one around who wants to use it!